This Isn't The Sort Of Thing That Happens To Someone Like You could be the title of any of Jon McGregor's four published books. He's a writer interested in moments that change lives and the legacy of these upon his characters. His debut, If Nobody Speaks of Remarkable Things, took this concept literally, fusing narratives charting the effects of a single incident and using them to create tension as another narrative built to that crescendo moment. Even the Dogs - his Dublin IMPAC Prize winning novel about a group of drug addicts watching the final journey of one of their own - is all about the after-effects of these single moments. 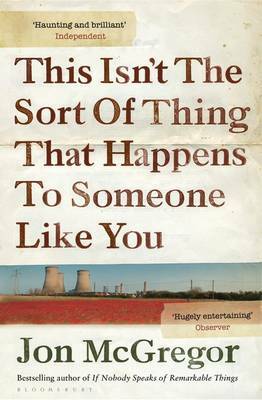 McGregor is a master of writing voice, particularly those of the dispossessed. He captures the humanity, the universal, without romanticising. His characters narrate with the hesitant, repetitive, circuitry, unfinished speech we all use. And his prose is vibrant, playful, energetic, and alive. The thirty stories collected in This Isn't The Sort Of Thing That Happens To Someone Like You have been written over the last decade: its a summary of his career to date as he grows from a talented wordsmith and storyteller to one of our foremost writers (and, in his own words, 'Britain's second best short story writer' - a reference to 'If It Keeps On Raining' and 'Wires' finishing as runner up in the BBC National Short Story Competition for 2010 and 2011 respectively), challenging conventions and forms of storytelling, pushing boundaries all the time with how words on a page can be used to communicate something. McGregor has written of his appreciation of David Foster Wallace and you can feel his influence here. This Isn't The Sort Of Thing That Happens To Someone Like You is funny, challenging, scary, affirming, and much more besides. It is very good indeed. The things you don't see happening to someone like you begin with an older couple, arguing gently over the washing up. They aren't all dramatic. A man builds a tree house by the river, in preparation for a coming flood. A sugar beet crashes through the windscreen of a young woman. Fighter jets fly overhead as a war looms. Crime, political tensions, environmental Armageddon, accidents, stagnation in life. They are all set in the vast flat landscapes of the Fen's, where sky and horizons blend and long flat roads stretch into the distance. Its farming landscape, traditionally mined in literature for themes of memory and forgetting. These are stories that explore the psychology of life in a flat reclaimed landscape, stolen from the sea, and where one of the things we don't see coming may just be its return to the sea. All the while, these places - Upwell, Irby in the Marsh, Messingham, Lincoln etc - feel as if they are being inscribed into stone against the forgetting of the future. These stories are born of cycling the landscapes. Their settings correspond with their imaginings. The landscapes are both incidental and central to providing cohesion to the collection. These landscapes are perhaps best explored in 'In Winter the Sky' where a woman's poems about the colour and atmosphere of the sky are set alongside a story about burying the past in the soil, only for floodwaters to bring it back to the surface years later. 'People are not drawn here by the romantic sound of the place. the flatness / hugeness / completeness of the landscape. One has a strange experience reading many of the stories here. McGregor experiments with different narrative styles - poetry alongside prose, stories told through a surveillance report or a redacted security document - and one goes into these with a slight sense of trepidation. Yet it is these stories that are some of the most rewarding. For they challenge ones sense of a story, of what a story is about, of why a story is told. If there is a criticism, it is that there are perhaps a few too many stories here. The three experiments with form, the five or six most engaging stories - 'Wires' and 'If It Keeps On Raining', 'Which Reminded Her Later', 'We Wave and Call' - and a few of the shorter entries would have been more than enough. Between six and ten fewer stories would have made it one of the finest collections I have encountered. Jon McGregor is my favourite contemporary British writer. It was delightful, therefore, to see this collection selected from a longlist of 116 books, to feature in the Summer Reads programme I run. Six great books selected by readers for readers. Books that inspire adventures and expand horizons. If you're looking for tried and tested books, these six come with a readers stamp of approval and a personal recommendation: we fell in love with these books and thought you might too. 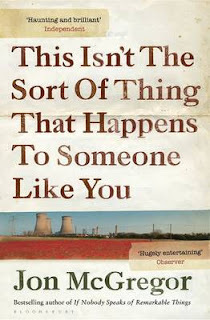 This Isn't The Sort Of Thing That Happens To Someone Like You was first published by Bloomsbury in 2012. The paperback edition, published in 2013 (ISBN: 9781408830383, 262pp) is available now.